Mining is often considered as one of the harder skills to train in RuneScape. This is mainly due to the fact that the experience rate is slower than that of most skills and there is the underlying fact that you can't use money to aid your training. This guide will cover the many various methods of Mining from making money to training at the most effective experience rate. Hovering over the name of some items will display basic details about that item including its current market price, and clicking on the name will bring up our Item Database entry for the item. A full list of all the normal pickaxes available and their respective price can be found here"> and the full listing on the prices of ores discussed throughout this guide can be found here">. This section will cover how to get the fastest experience rates in the game for both free-players and members alike and where the best mining areas are to get experience for the given circumstances. This guide will cater the needs of any onlooking miner at any given level looking for the best methods of getting experience. None of the formulas throughout this section of the guide will consider the possibility of having completed any quests, with the exception of "must-be-finished" quests. Please note that the formulas in this guide will never consider the use of the Sacred Clay Pickaxe, so if you intend on using this pickaxe you need to halve the given number. Information on the Sacred Clay Pickaxe can be found in the sections later on. If you finish any quests giving Mining experience while following this guide, then the formulas will be inaccurate to some extent. To get more accurate calculations suited specifically for your needs, please check out the Mining Calculator. If at any time you become bored with training your Mining for fast experience, you can either take a rest or train other skills or read up on the Mining Guide and go hunt out for different rocks to mine. Keep in mind at level 60 Mining, you have access to the Mining Guild. To start your journey on mining your way up the ranks you will first need to get the most essential tool: the pickaxe. You should automatically have a bronze pickaxe on your toolbelt. If you wish to obtain a pickaxe of higher quality, you can either buy one from Nurmof's Pickaxe Shop in the Dwarven Mines or you can buy one at the Grand Exchange, located north of the western-most bank in Varrock. Wielding a Bronze or Iron Pickaxe does not have any Attack level requirements. Wielding a pickaxe is generally used to save space for an additional ore, although you can also add the pickaxe to your toolbelt. When you reach level 6 Mining you have the ability to use a Steel Pickaxe, which is worth considering if you have the money available. In order to reach level 6 Mining from level 1, you need to mine 30 Copper Ore or Tin Ore. This will bring you to 525 experience. Wielding a Steel Pickaxe requires you to have at least an Attack level of 20. The steel pickaxe can also be added to the toolbelt. To reach 15 Mining from level 6 you will need to have mined 108 Copper Ore or Tin Ore. You can also mine a combination of the ores to your liking. You should end up with 2,415 experience if you mined exactly 108 of a combination of either Copper Ore or Tin Ore.
To reach level 21 Mining from level 15 to enable the use a Mithril Pickaxe, you will need to have mined 75 Iron Ore. From mining 75 Iron Ore at 2,415 experience, your experience should then be at 5,040. To wield a Mithril Pickaxe, your Attack level must be at least 30. At level 31 Mining you will then be able to use an Adamant Pickaxe for mining purposes. To reach level 31 Mining from level 21, you are required to mine 280 Iron Ore and should bring your experience to 14,840. If you want to wield an Adamant Pickaxe, you must possess an Attack level of 40 or greater. The last pickaxe you will ever be able to use as a free-player is the Rune Pickaxe. The Rune Pickaxe requires level 41 Mining to use. To get level 41 Mining you must obtain 753 Iron Ore, which will result in your experience value being at 41,195. Wielding a Rune Pickaxe requires an Attack level of at least 50. Now that you have the best pickaxe available to you, the method is up to you to decide whether to bank or drop the Iron Ore that you mine. Keep in mind the potential money you could be losing in the long run if you decide to "dropmine" it. Getting to level 99 from level 41 will require you to mine 371,236 Iron Ore. To record how long this will take you, count how many Iron Ore you can get in an hour and multiply that by the number of hours you usually play per day. Divide that number by 371,236 and you will know how many days of mining is required for you to reach the best Mining level in the game. One alternative method for training mining in members that requires no mining at all is looting warband camps in the wilderness. It is a dangerous activity, but can be fun. Check out the Wilderness Warbands guide for more information. You can use a Steel Pickaxe after you reach level 6 Mining, which is worth considering if you have the money available. In order to reach level 6 Mining from level 1, you need to mine 30 Copper Ore or Tin Ore. This will bring you to 525 experience. Wielding a Steel Pickaxe requires you to have at least an Attack level of 20. To obtain level 15 Mining from level 6, you will need to mine 108 Copper Ore or Tin Ore in whatever combination you like. You should end up with 2,415 experience if you mined exactly 108 of a combination of either Copper Ore or Tin Ore. If you want a faster experience rate you can drop your ores to continue mining, which is referred to as or "dropmining". If you intend to perform "dropmining", you can also use these mining areas: Rimmington, Edgeville Dungeon, Al Kharid, Rellekka, north-east of East Ardougne and south of the East Ardougne zoo. After reaching level 21 Mining from level 15, you are enabled to use a Mithril Pickaxe. You will need to have mined 75 Iron Ore to reach level 21 Mining. From mining 75 Iron Ore, your experience should then be at 5,040. To wield a Mithril Pickaxe, your Attack level must be at least 30. You can also add the pickaxe to your toolbelt. When you reach 31 Mining, you have the ability to use an Adamant Pickaxe for mining. To reach level 31 Mining from level 21, you are required to mine 280 Iron Ore and should bring your experience to 14,840. If you want to wield an Adamant Pickaxe, you must possess an Attack level of 40 or greater. Again, you can also add this pickaxe to your toolbelt. Lastly, for you to achieve 35 Mining from level 31 you will need to mine 217 Iron Ore. This will bring your experience to a value of 22,435. You can also teleport directly to the Quarry with the Camulet from the Enakhra's Lament Quest. This amulet has 4 charges and to recharge the Camulet you must use Ugthanki Dung on it, which is found by Ali the Camel Man's house located in Pollnivneach. As soon as you reach level 45 Mining, you should switch to mining Granite. Granite gives the fastest experience in the game at around 60,000 experience per hour. Granite is located in the same place as Sandstone. If you can't meet these requirements, then you should stick to mining Iron Ore. Mining Iron Ore is covered in an earlier section. This is the Rune Pickaxe, which requires level 41 Mining to use. To get to level 41 Mining from level 35, you will need to mine anywhere from 196 to 392 pieces of Sandstone based on the size of the chunks mined. If you are mining Iron Ore from 35 Mining, you will need to have mined 536 Iron Ore. Following either of these methods will bring your experience to a value of around 41,195. Wielding a Rune Pickaxe requires an Attack level of at least 40. Wielding a pickaxe is generally used to save space for an additional ore. The fastest pickaxe in the game for members is the Dragon Pickaxe, which requires level 61 Mining to use. The Dragon Pickaxe is around 10-15% better than the Rune Pickaxe. To get to level 61 Mining from level 41, you will need to mine anywhere from 8,704 to 4,352 pieces of Sandstone based on the size of the chunks mined. If you are mining Iron Ore from 41 Mining, you will need to have mined 7,460 Iron Ore. Following either of these methods will bring your experience to a value of around 302,295. Wielding a Dragon Pickaxe requires an Attack level of at least 60. Wielding a pickaxe is generally used to save space for an additional ore. This particular pickaxe has a special attack called "Shock", which drains 100% of the Special Attack Energy Bar and increases your maximum hit while draining your victim's Attack, Ranged, and Magic levels by 5%, though it is slower than a normal attack. Unlike all other pickaxes, you must obtain it from another player or by killing the monster that drops it, which are the Chaos Dwogres (level 117), Chaos Dwarf Hand Cannoneers (level 100), and even the Chaos Dwarves (level 48). To reach these monsters, you must have completed the Forgiveness for a Chaos Dwarf Quest. This pickaxe is known as the Inferno Adze. It requires level 41 Mining and level 92 Firemaking to use and is the same mining speed as the Rune Pickaxe. The only difference between this one and the Rune Pickaxe is that this one is also capable of being used as a Woodcutting axe. To obtain the Inferno Adze, you need to fully complete the All Fired Up Activity. This pickaxe has no Attack requirements to wield. It cannot be added to the toolbelt. This is the Sacred Clay Pickaxe, obtained through the Stealing Creation Activity. It requires level 40 Mining to use and is the same speed as the Rune Pickaxe. This pickaxe doubles the experience you get per ore mined, but is not permanent like all of the other pickaxes and will crumble to dust after a certain number of uses. There is also a Volatile form of this pickaxe, though the shape that this tool takes on is completely random and changes every so often. The Volatile Clay Pickaxe yields slightly better experience than that of the Sacred form, but is not that popular due to its random morphing. These pickaxes have no Attack requirements to wield. The Sacred Clay Pickaxe cannot be added to the toolbelt. If you wish to get 99 Mining purely from granite, you're in for a long ride. Going from level 61 Mining to level 99 via Granite will require you to mine anywhere from 254,643 to 169,762 pieces of Granite based on the size of the chunks mined. If you are stuck mining Iron Ore, then you will need to have mined 363,776 Iron Ore to reach level 99 Mining. If at some point during your Mining career that you are able to mine Granite instead of Iron Ore, then this number is inaccurate. Fortunately there are other methods. If you have completed the King of the Dwarves Quest you can access the Lava Flow mine in East Keldagrim at level 68 mining. 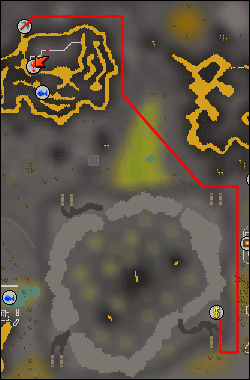 The Lava Flow Mine is not better experience than granite, being only 30-40k XP an hour. However, it is AFKable, your inventory will not fill up with ore to drop, and can give you the Golden Mining outfit. 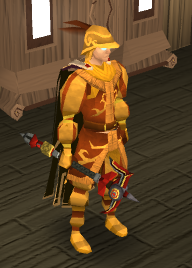 The Golden Mining outfit grants you +1% mining experience per piece, and will grant you an additional 1% for the entire set making it 6% extra experience for the whole set. Getting the entire set can take quite some time and it is largely luck based; the nymph who gives you the pieces comes at random intervals. However usually it will take around 10 hours to get the entire set. After you have received all five parts of the mining suit, the golden nymph can also gild your pickaxe. Once you have completed the Birthright of the Dwarves, you also unlock the lava geyser random event. To complete this random event, cool off the geysers with water or ice spells and then mine them. From this you can gain the four Imcando Pickaxe pieces. When you have all four pieces, take the pieces, a gilded dragon pickaxe, one million gold pieces, and a redberry pie to Thurgo near Mudskipper point, who will give you an Imcando Pickaxe. Thurgo will take a gilded Dragon Pickaxe from your toolbelt. The Imcando Pickaxe itself cannot be added to the toolbelt. The Imcando Pickaxe is not faster than the Dragon Pickaxe but will incinerate 25% of the ores you mine, leaving you with smithing experience. The Imcando Pickaxe can also be enchanted for 20% bonus experience, but only has 100 charges before you need to recharge it on a lava geyser. To figure out which strip you should mine in the Lava Flow Mine, you should investigate the steam gauges at the mine. The lower the % flow, the higher mining experience you will get. You should ideally be looking for a 50% flow rate. For help with this, you should check out World 71, the official Lava Flow Mine world. This will help you find the best strips to mine, as well as people to socialize with. 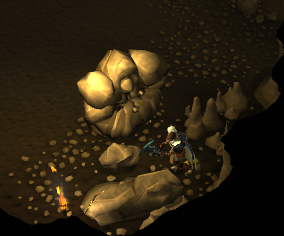 At level 77, you can access the Living Rock Cavern in the north part of the Falador Dwarven Mines. Until level 80, you will have to mine the concentrated coal deposits. When mining from a concentrated vein, there is the probability of mining 2 ores per swing. Once you are level 80, you can hit the concentrated gold deposits. There is an area where you can deposit your ores near the entrance, but it is faster to drop the ores (using the ability bar method) and make the money via other means. If you do wish to bank the ores, you should use signs of the porter, which you can learn about in the Divination guide. The living rock caverns is a dangerous area filled with (you guessed it) living rock creatures. Although these are not too strong, they will get annoying after awhile and can cause you to bank for food. To deal with this, you should head over to World 84, the Living Rock Caverns world. Here, there are other miners, and anyone who has gone through their freshman year of high school knows that safety is in numbers. Alternatively, you can try the quick hopping method. Head to the southern most gold deposit and find the small area you can walk into where the living rock creatures cannot attack you. Then, mine the gold deposit and once it has been depleted hop worlds until you find another. The small southern safe area where you can mine and quick hop. In the Living Rock Caverns, you can superheat the gold ores you get while wearing goldsmith gloves (from Family Crest). This will allow you to train Mining, Smithing, and Magic all at once. At level 89, you should ideally move to Seren stones. The issue with Seren Stones is that this method requires quite a bit of quests and other skills. You need to complete Plague's End (and it's requirements such as Mourning's Ends Part II), which in turn requires ten level 75 skills. Nevertheless, if you plan on going for level 99 mining or beyond, you should complete the requirements to access this training method, as it is by far the best training method in the game. The experience here is around 120-140k xp an hour without the voice of Seren and around 175k xp an hour with the voice of Seren. It is also more AFKable than Living Rock Caverns because the ore you receive stacks in your inventory and you will not have to drop or bank your ores at all. The ore you receive, corrupted ore, will give 150 or 180 smithing XP when smelted, depending on whether the voice of Seren is illuminating the Trahaearn section, so this is method will also allow you to gain some smithing experience. This section will cover how to get a decent amount of money while training Mining for both free-players and members alike and where the best mining areas are. This guide will cater the needs of any onlooking miner at any given level looking for the best methods of getting money while not worrying about experience. To get accurate calculations for a desired goal suited specifically for your needs, please check out the Mining Calculator. If at any time you become bored with training your Mining for money, you can either take a rest or train other skills or read up on the Mining Guide and go hunt for different rocks to mine. Keep in mind at level 60 Mining, you have access to the Mining Guild. To begin reaping the benefits that Mining has to offer, you will first need to get the most important tool: the pickaxe. A free Bronze Pickaxe can be obtained from the Mining Tutor south of Lumbridge at the Lumbridge Swamp. 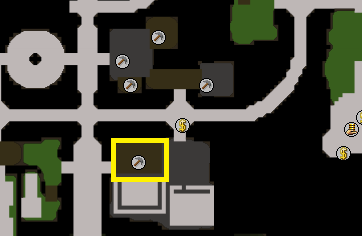 If you wish to obtain a pickaxe of higher quality, you can either buy one from Nurmof's Pickaxe Shop in the Dwarven Mines or you can buy one at the Grand Exchange, located north of the western-most bank in Varrock. Wielding a Bronze or Iron Pickaxe does not have any Attack level requirements. Wielding a pickaxe is generally used to save space for an additional ore.
Soft Clay Item Database entry. When you reach level 6 Mining you have the ability to use a Steel Pickaxe, which is worth considering if you have the money available. Wielding a Steel Pickaxe requires you to have at least an Attack level of 5. Iron Ore Item Database entry. At level 21 Mining, you are enabled to use a Mithril Pickaxe. To wield a Mithril Pickaxe, your Attack level must be at least 30. Wielding a pickaxe is generally used to save space for an additional ore. When you reach 31 Mining, you have the ability to use an Adamant Pickaxe for mining. If you want to wield an Adamant Pickaxe, you must possess an Attack level of 40 or greater. Wielding a pickaxe is generally used to save space for an additional ore.
Silver Ore Item Database entry. Pure Essence Item Database entry. The fastest pickaxe currently in Runescape for free-players is the Rune Pickaxe, which requires level 41 Mining to use. Wielding a Rune Pickaxe requires an Attack level of at least 50. Wielding a pickaxe is generally used to save space for an additional ore. This pickaxe is known as the Inferno Adze. It requires level 41 Mining and level 92 Firemaking to use and is the same mining speed as the Rune Pickaxe. The only difference between this one and the Rune Pickaxe is that this one is also capable of being used as a Woodcutting axe. To obtain the Inferno Adze, you need to fully complete the All Fired Up Activity. This pickaxe has no Attack requirements to wield. Wielding a pickaxe is generally used to save space for an additional ore. This is the Sacred Clay Pickaxe, obtained through the Stealing Creation Activity. It requires level 40 Mining to use and is the same speed as the Rune Pickaxe. This pickaxe doubles the experience you get per ore mined, but is not permanent like all of the other pickaxes and will crumble to dust after a certain number of uses. There is also a Volatile form of this pickaxe, though the shape that this tool takes on is completely random and changes every so often. The Volatile Clay Pickaxe yields slightly better experience than that of the Sacred form, but is not that popular due to its random morphing. These pickaxes have no Attack requirements to wield. Wielding a pickaxe is generally used to save space for an additional ore.
Gold Ore Item Database entry. Mithril Ore Item Database entry. Mithril Bar Item Database entry. Nature Rune Item Database entry. The fastest pickaxe in the game for members is the Dragon Pickaxe, which requires level 61 Mining to use. Wielding a Dragon Pickaxe requires an Attack level of at least 60. Wielding a pickaxe is generally used to save space for an additional ore. This particular pickaxe has a special attack called "Shock", which drains 100% of the Special Attack Energy Bar and increases your maximum hit while draining your victim's Attack, Ranged, and Magic levels by 5%, though it is slower than a normal attack. Unlike all other pickaxes, you must obtain it from another player or by killing the monster that drops it, which are the Chaos Dwogres (level 117), Chaos Dwarf Hand Cannoneers (level 100), and even the Chaos Dwarfs (level 48). To reach these monsters, you must have completed the Forgiveness for a Chaos Dwarf Quest. Also, members can mine coal and gold ore from concentrated ore deposits in the Living Rock Cavern accessed in the Dwarven Mines near Nurmof's Pickaxe Shop, which contain a lot of ores per rock! To mine from a concentrated coal deposit, you need a Mining level of 77 and to mine from a concentrated gold ore deposit you need a Mining level of 80. Beware however, there are high-leveled monsters roaming about this area and will not hesitate to take you down! When mining from a concentrated vein, there is the probability of mining 2 ores per swing. Mining the concentrated coal deposits is great for "superheat mining", which is where you carry metallic ores with you and mine coal to use the Superheat spell with. This requires a Magic level of 43, along with a Fire Staff or 4 Fire Runes and 1 Nature Rune per cast. Adamantite Ore Item Database entry. Adamant Bar Item Database entry. If you don't like mining Adamantite Ore for money due to the world switching issue or competition issues, you can always stick to the lower leveled methods or the method mentioned about concentrated ore deposits. If you don't like mining Runite Ore for money due to the world switching issue or competition issues, you can always stick to the lower leveled methods. Runite Ore Item Database entry. 1. 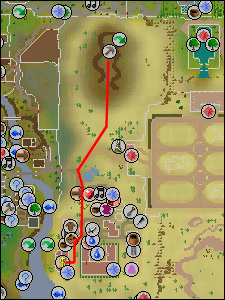 Varrock east bank to Rune Essence mines. 2. 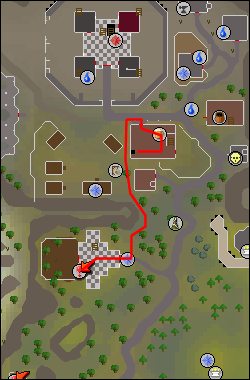 Yanille bank to Magic Guild Rune Essence mines. 1. 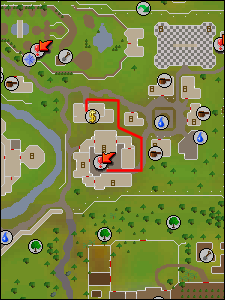 Varrock west mine to bank. 2. Port Khazard mine to Port Khazard deposit box. 3. Haunted Mines to Burgh de Rott bank. Requirements: In Aid of the Myreque Quest for the bank in Burgh de Rott and the Haunted Mine Quest. A high combat level is advised to avoid the danger of the level 50 possessed pickaxes throughout the dungeon. Requirements: None. Contains tin only. 2. 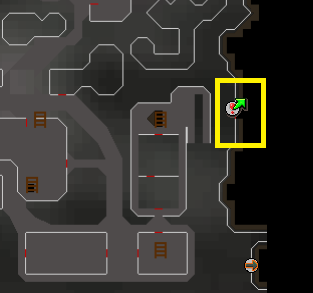 Varrock east mine to bank. Requirements: None. Contains copper only. 3. East of the Lumbridge Swamp to the Lumbridge bank on the third floor of the Lumbridge Castle. 4. Dwarven Mines to Falador bank. Requirements: None, but a combat level of 65 is highly recommended so that the scorpions in the area will not be aggressive towards you. 5. Port Khazard mine to Port Khazard deposit box. 6. 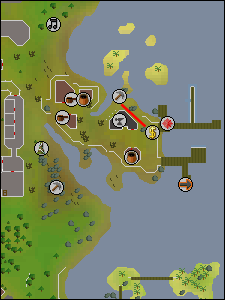 West of Falador mine to Falador bank. 1. 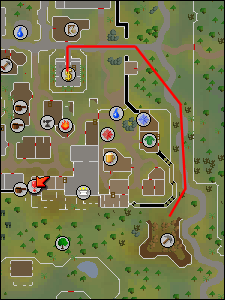 Varrock east mine to bank. 2. 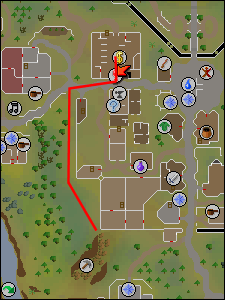 Varrock west mine to bank. 3. Dwarven Mines to Falador bank. 4. Dwarven Mines to Living Rock Cavern deposit box. 5. Dwarven Mines to nearby resource dungeon deposit box. Requirements: Level 15 Dungeoneering and a combat level of 65 is highly recommended so that the scorpions in the area will not be aggressive towards you. 6. Port Khazard mine to Port Khazard deposit box or Yanille bank. Requirements: None. 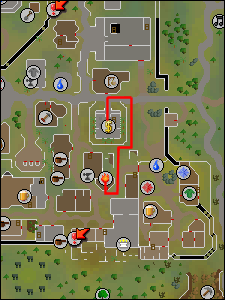 Depending on which spot you mine your ores at this spot will determine the best banking spot. 7. 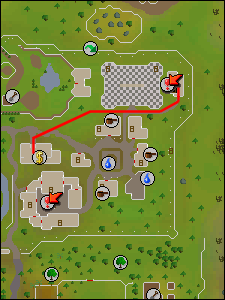 Dorgeshuun mining area to Lumbridge bank. Requirements: Completion of Lost Tribe Quest. You are also required to bring a light source with you when mining at this area. 8. 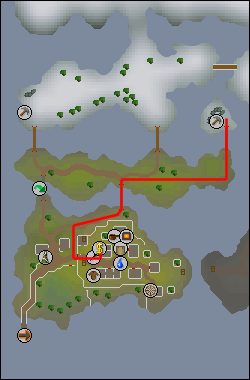 West of Falador mine to Falador bank. 9. Piscatoris mine to Castle Wars bank or Edgeville bank. Requirements: Level 57 Summoning for the Spirit Kyatt to gain fast access and either a Ring of Dueling or a charged Amulet of Glory to teleport near a bank. 2. Al Kharid mining chasm to Al Kharid bank. Requirements: 29 Combat is advised so that the scorpions become non-aggressive towards you. 3. Dwarven Mines resource dungeon to resource dungeon deposit box. Requirements: Level 15 Dungeoneering, be careful of the scorpions when trying to enter the resource dungeon if you don't have a combat level of 65. 4. Crafting Guild mine to Falador bank. Requirements: 40 Crafting along with wearing a Brown Apron to get into the Crafting Guild. An Explorer's Ring 3 from the Lumbridge Tasks would help with faster banking times. 5. 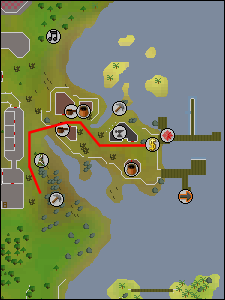 TzHaar mining area to bank. 6. 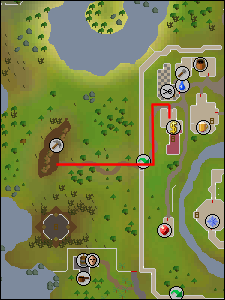 Dorgeshuun mining area to Lumbridge bank. 7. Grand Tree Dungeon mine to Grand Tree bank. Requirements: Must have completed the Grand Tree Quest. 1. Dwarven Mines to Falador bank. 2. Lumbridge Swamp western mine to Draynor Village bank or the Lumbridge Home Teleport spell. Requirements: None, but an Explorer's Ring 3 from the Lumbridge Tasks would help with faster banking times. 3. Mining Guild to Falador bank. 4. Dwarven Mines resource dungeon to nearby resource dungeon deposit box. 5. Living Rock Cavern to Living Rock Cavern deposit box. Requirements: Level 77 Mining is required to mine in this particular area. A high combat level is advised as there is the constant threat of several high level monsters attacking you. A method of healing is recommended. It is worth noting that in this area, you can mine a lot of ores from a single rock and have the possibility to mine 2 ores per swing. 6. Coal Trucks to Seer's Village bank. Requirements: None, but level 20 Agility is highly recommended. Having a Seer's Headband from the Seer's Village Tasks would also be helpful so you can put more coal into the coal trucks. 1. The Quarry south of the Desert Bandit Camp, only used for "dropmining". "Dropmining" is a term used to describe dropping ores to continue mining for better experience. Requirements: Waterskins to survive thirst and Desert Robes are highly recommended to make Waterskins last longer. Completing the Enakhra's Lament Quest to use the Camulet is recommended. 3. Karamja Dungeon to Draynor Village bank. Requirements: None, although the Explorer's Ring 3 from the Lumbridge Tasks is highly advised for faster banking times. Requirements: 40 Crafting along with wearing a Brown Apron to get into the Crafting Guild. An Explorer's Ring 3 from the Lumbridge Tasksy would help with faster banking times. 5. Living Rock Cavern to Living Rock Caverns deposit box. Requirements: Level 80 Mining is required to mine in this particular area. A high combat level is advised as there is the constant threat of several high level monsters attacking you. A method of healing is recommended. It is worth noting that in this area, you can mine a lot of ores from a single rock and have the possibility to mine 2 ores per swing. 6. Keldagrim north mines to Keldagrim bank. Requirements: Must have completed the Forgiveness of a Chaos Dwarf Quest. 7. 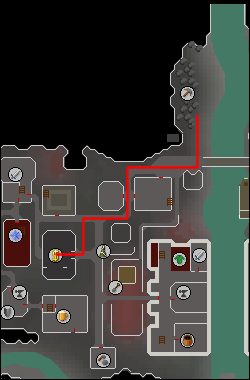 (Members): TzHaar mining area to TzHaar bank. 8. Arzinian Gold Mines to the Dwarf east of the mining location within Keldagrim. Requirements: Must have completed the Between a Rock Quest. 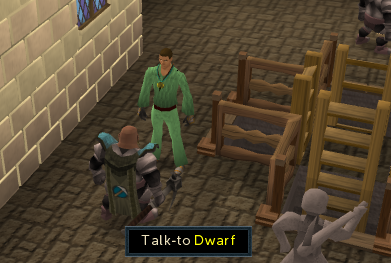 When you deposit your ores with the Dwarf, he will take a small portion of them for compensation of banking them for you. The amount he takes is reduced when wearing a Ring of Charos (a) from the Garden of Tranquility Quest. 9. Grand Tree Dungeon to Grand Tree bank. 10. The Quarry south of the Desert Bandit Camp, only used for "dropmining". "Dropmining" is a term used to describe dropping ores to continue mining for better experience. 2. Lumbridge Swamp western mine to Draynor Village bank. 3. Crandor Island to Draynor Village bank. Requirements: None, but an Explorer's Ring 3 from the Lumbridge Tasks is highly advised for faster banking times. 4. Mining Guild to Falador bank. Requirements: Level 60 Mining, level 45 Dungeoneering is also very beneficial to access the nearby resource dungeon. 5. Haunted Mines to Burgh de Rott bank. Requirements: Must have completed the Haunted Mine Quest and the In Aid of the Myreque Quest to be able to use the shortcut. You are also required to carry the Crystal-mine Key with you. A high combat level is advised to avoid the danger of the level 50 possessed pickaxes throughout the dungeon. 6. Grand Tree Dungeon to Grand Tree bank. 4. Al Kharid mining chasm to Al Kharid bank. 5. 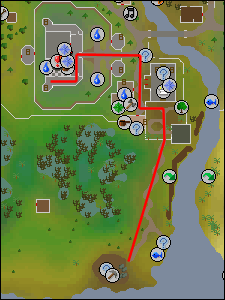 Mining Guild resource dungeon to Falador bank. Requirements: Level 60 Mining and level 45 Dungeoneering. 7. Haunted Mines to Burgh de Rott bank. 8. Grand Tree Dungeon to Grand Tree bank. 5. Prifddinas mine (Trahaearn section) to Trahaearn bank. Requirements: Must have completed the Plague's End quest. 1. 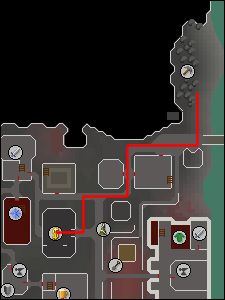 Runite mine located in Level 46 Wilderness to Wilderness Volcano bank. Requirements: None, but a high Defence level is strongly recommended. Players can attack at any moment. 4. 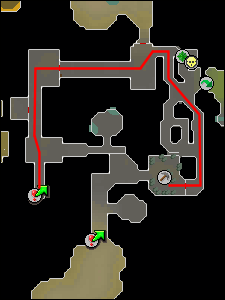 Mining Guild resource dungeon to Falador bank. 3. 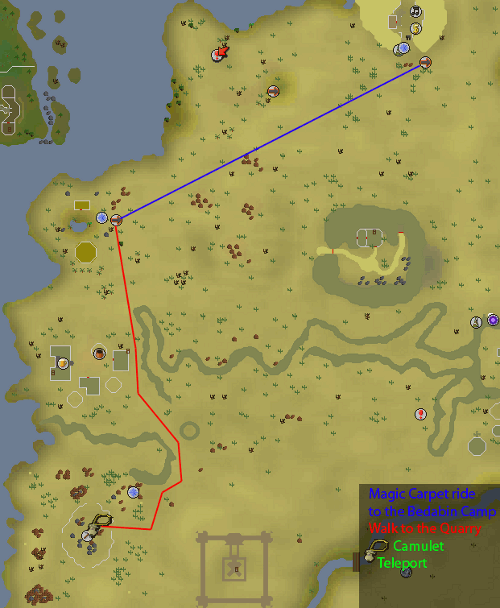 Keldagrim north mines to Keldagrim bank. 4. Hero's Guild mine to Rogue's Den bank. Requirements: Must have completed the Heroes Quest. Try mining in areas that some people would never think to go on a world with a large population. This can ensure that the ores there are yours for the taking and can offset any time wasted by other miners out-mining the rock. This is especially useful for those that "superheat-mine", or use the superheat spell to smelt ores while mining. The superheat spell requires a Magic level of at least 43. On higher populated worlds, ore respawns faster. Try and take advantage of any bonus experience opportunities that you may come along. These bonuses include Experience Lamps and Books of Knowledge from Random Events along with Antique Lamps from completing certain tasks. Antique Lamps can be obtained from completing the Stronghold of Player Safety quiz and completing portions of the Lumbridge Tasks. 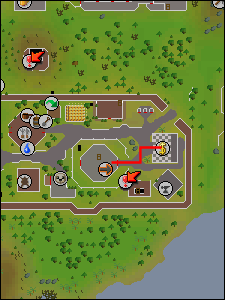 For members, you can obtain Antique Lamps from the Varrock Museum mini-quest, completing portions of the Falador Tasks, completing portions of the Varrock Tasks, completing portions of the Karamja Tasks, completing portions of the Fremennik Tasks, and completing portions of the Seer's Village Tasksy. For bonus experience, free-players can obtain some through completing the levels of the Stronghold of Security. As for members, you can get some through completing tasks for the Wise Old Man. Mining can be combined with other skills. For example, you can mine ores and use the superheat spell on them to smelt the ores on the spot, though this requires level 43 Magic and the appropriate Smithing level required to smelt the ores. This is referred to as "superheat mining". That way you will get Mining, Magic, and Smithing experience all at the same time. If you are a member and have at least level 44 Runecrafting, you can make your own Nature Runes. The Mining skill can also be combined with skills like Crafting with gems and other skills with the special uses some ores have. Always try and maintain the lowest weight possible while mining. Members have weight-reducing clothes such as the Boots of Lightness, Spotted/Spottier Cape, Penance Gloves, Agility Top, and Agility Legs to reduce their weight. For more detailed information on such items, refer to the Agility skill guide. Keep any gems you happen to come across while Mining, unless you are "dropmining". "Dropmining" is a term used to drop the ores that you mine in order to get faster experience. you can either use these later for Crafting or sell them to other players or on the Grand Exchange. You can increase your chance of mining a gem by wearing an Amulet of Glory. You can only get a Sapphire, Emerald, Ruby or a Diamond in the uncut form from the Mining skill. For members, you can also mine gems from gem rocks which are located in Shilo Village or located at a special mine accessible by teleporting with the Karamja Gloves 3 from the Karamja Tasks. From mining gem rocks, you can also get the uncut variation of Opal, Red Topaz, and Jade that are used in the Crafting skill. Getting into Shilo Village requires you to have completed the Shilo Village Quest. Dwarven Stouts can be bought from the Pub in Falador and drinking one will increase your Mining and Smithing levels by 1. As such, Dwarven Stouts will enable you to enter the Mining Guild while being at level 59 Mining, but you will have to drink one every time you go in until you reach level 60 Mining. Also note that its effects last even if you log out and change worlds. For members, you can also brew you own Dwarven Stouts and need a Cooking level of at least level 19 to do so. When brewing there is a chance that you will make some mature Dwarven Stout, which raises your Mining and Smithing levels by 2 instead of the regular 1. You can increase the chance of getting mature ales by using The Stuff, a reward from the Trouble Brewing Activity. For more information on how to brew Dwarven Stouts, refer to the Brewing Guide. If you have a Dungeoneering and Crafting level of 25, you can purchase a Gem Bag from Marmaros at Daemonheim. It can hold 100 uncut gems ranging from Sapphire to Diamond. However, you may not be able to buy one until a higher Dungeoneering level is obtained due to a shortage of tokens at the required level. If you have a Dungeoneering and Mining level of 35, you can purchase a Coal Bag from Marmaros at Daemonheim. It can hold up to 27 Coal, making it useful for mining up to 54 Coal or for smelting ores that require Coal. However, you may not be able to buy one until a higher Dungeoneering level is obtained due to a shortage of tokens at the required level. For members, there are Brawling Gloves (mining) that give a 50% bonus towards your gained Mining experience on a PVP world or 4x the amount of experience in Mining while training in the Wilderness on a PVP world. This item can only be obtained through player-killing on a members only world. This item is not permanent and will crumble to dust after a certain number of uses. 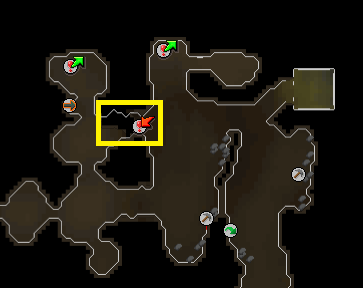 For members, you can easily access the Mining Guild by teleporting there using a Skills Necklace. A Skills Necklace is an enchanted Dragonstone Necklace and has 4 charges when fully charged. To recharge a Necklace of Skills you can recharge it at the totem in the Legend's Guild, which requires you to have completed the Legend's Quest. For members, if you find yourself running a lot or a long distance from a mine to a bank you may want to use some Super Energy Potions to restore your run energy. Refer to the Herblore skill for more information on how to make these potions. Each dose of potion restores 40% of your run energy. For members, if you have completed portions of the Varrock Tasks you will be rewarded with a special armour called the Varrock Armour. This special armour allows you to have the chance to mine an extra ore from one successful mining attempt. For those wearing the first variation you can get an extra ore up to Coal, the second variation allows up to Mithril Ore, and the final variation allows up to Adamantite Ore.
For members, Summoning is also a great method of helping you mine your ores whether it be holding extra ores, restoring your run energy, or boosting your Mining level. Familiars that can hold extra ores are the thorny snail at level 13 (3 items), spirit kalphite at level 22 (6 items), bull ant at level 40 (9 items), spirit terrorbird at level 52 (12 items), war tortoise at level 67 (18 items), and pak yak at level 96 (30 items). The spirit terrorbird is extra useful as this particular familiar can restore an amount of energy restored dependent on your Agility level. Also, certain familiars can boost your Mining level such as the desert wyrm familiar at level 18 Summoning (manual +1), which also assist you in mining iron. Other familiars giving a boost to your Mining level are the void ravager at level 34 (invisible +1 and manual +1), obsidian golem at level 73 (invisible +7), and lava titan at level 83 (invisible +10). For members, using an Bracelet of Clay enables you can mine soft clay instead of normal clay. This means you do not have to water them one by one and this could become handy if you use the Soft Clay for Crafting. Each bracelet has 28 charges before it crumbles to dust. For members, there is a special pickaxe called the Sacred Clay Pickaxe that doubles the amount of experience earned while mining ores. It is obtained from the Stealing Creation Activity, though this pickaxe is not permanent and will crumble to dust after a certain number of uses. There is also a Volatile form of this pickaxe, though the shape that this tool takes on is completely random and changes every so often. The Volatile Clay Pickaxe yields slightly better experience than that of the Sacred form, but is not that popular due to its random morphing. To use these pickaxes, you need a Mining level of at least 40. If you are using the Varrock Armour, if you mine 2 ores from 1 rock then only 1 of the ores will give bonus experience and does not subtract 2 uses from the pickaxe. These pickaxes have no Attack requirements to wield. Wielding a pickaxe is generally used to save space for an additional ore.
For members, one can obtain a special item from the Barbarian Assault Activity that doubles the amount of experience you receive from mining ores. Over time, the horn will lose it's ability to provide the doubled experience and can be recharged by playing more games of Barbarian Assault. A master horn is obtainable for those that have mastered any role, which can hold significantly more charges than the regular horn. You must manually choose whether to gain charges for your horn or to gain honor points in the lobby room before a wave begins. The horn can be worn in the shield slot, so that you still have the ability to maximize the amount of ores that you can mine per run. For members, you can partake in an ongoing event known as the Shooting Star Distraction & Diversion. To get started, you must use a Player-Owned-House. If you intend to use your own, you must have a Construction level of at least 44 to build a telescope. Begin by looking through a telescope and you will be displayed with information on where the next star will land on that world. The time and place are only approximations and is more accurate with better telescopes. After you have found the star you can mine it to get Stardust, which you can trade in later once the alien inside of the rock is freed. You can only trade in 200 Stardust per day though. When mining a star, there is the chance that you might get uncut gems. The chance of mining a gem is increased on higher layered stars and the chance is further increased with an Amulet of Glory. For more information regarding to the rewards and level requirements on this Distraction & Diversion, take a look at the Shooting Star guide. For members, you can play the Mobilising Armies Activity to get a useful tool called a Locator to teleport you to mining areas. Each variation has 50 charges and when you go to get a new one you will have a discounted price. The place that this tool teleports you to is completely random and the quality of the mining area is dependent on the type of Locator that you use. Beware, this tool could teleport you to dangerous locations such as the Wilderness. Sometimes the tool will fail to teleport you, though when this happens a charge is not taken away. When you achieve the greatest level of them all, level 99 Mining, you will then be able to claim to the Mining Skillcape to show off your hard-earned work. The cape can be bought from the Dwarf near the stairs of the Mining Guild. Be sure to read the Capes of Achievement guide if you wish to learn more information regarding the Mining Skillcape. This section will cover all of the available quests in Runescape that offer Mining experience as a reward for both free-players and members alike. Some quests have optional experience rewards, which will be covered. Completing any quests will disrupt the accuracy of the any of the calculations throughout this guide. For making accurate calculation suited specifically for your needs, please take the time to look at the Mining Calculator. Quests in this section will be ordered by the amount of experience rewarded.